Tower Fall is the most well-known natural feature in the area. The 132-foot drop of Tower Creek, framed by eroded volcanic pinnacles has been documented by park visitors from the earliest trips of explorers into the Yellowstone region. Its idyllic setting has inspired numerous artists, including Thomas Moran. His painting of Tower Fall played a crucial role in the establishment of Yellowstone National Park in 1872. Specimen Ridge, located along the Northeast Entrance Road east of Tower Junction, contains the largest concentration of petrified trees in the world. There are also excellent samples of petrified leaf impressions, conifer needles, and microscopic pollen from numerous species no longer growing in the park. The Petrified Tree, located near the Lost Lake trailhead, is an excellent example of an ancient redwood, similar to many found on Specimen Ridge. The road between Tower Junction and Canyon Village (which opens late May or sooner if conditions allow) goes over Dunraven Pass, the highest road in the park at 8,859 feet (2700 m). Along the way you will find spectacular views of the Absaroka Mountains, the Yellowstone Caldera, and, on a clear day, the Teton Range to the south. This road also travels through areas where bighorn sheep, elk, black and grizzly bears are often seen. The are numerous good hiking trails in the area, ranging from one to 10 miles. From the Tower Fall Overlook, The trail to the bottom is a one mile round trip. The trail descends about 300 feet in a half mile. Coming back out is steep and somewhat strenuous. The Lost Lake Loop Trail departs from behind Roosevelt Lodge and climbs 300 feet (91 m) onto the bench. Here the trail joins the Roosevelt horse trail and continues west to Lost Lake. (If you take the trail east, you loop back to the Roosevelt corrals on the horse trail or continue on to Tower Fall Campground.) From Lost Lake, the trail follows the contour around the hillside to the Petrified Tree parking area. Offers views of Lost Lake, waterfowl, wet meadows, sagebrush hilltops, wildflowers, and quite often black bears. Lost Lake Loop. Round trip 4 miles (6.4 km), moderate. The trail starts behind Roosevelt Lodge and climbs 300 feet up a forested hillside. At the junction, veer right (west). You reach Lost Lake in 0.2 miles (0.3 km). From there, follow the trail through a ravine to the Petrified Tree parking area. From the parking lot, the trail climbs to a sagebrush meadow, descends to the Tower Ranger Station area, and then 0.2 miles (0.3 km) to Roosevelt Lodge. If you encounter horses, move to the downhill side of the trail and remain still until they have passed. Yellowstone River Picnic. Round trip 3.7 miles (5.9 km), moderate. Begin at the Yellowstone River Picnic area, 1.25 miles (2 km) northeast of Tower Junction on the Northeast Entrance Road. The trail climbs steeply to the east rim of the Narrows of the Yellowstone River and then follows the rim. Return the same way or make a loop by continuing to the next trail junction, where you need to turn left and descend to the road. (The Specimen Ridge Trail, strenuous and poorly marked, continues northeast.) Walk west along the road for 0.7 mile (1.1 km) to the picnic area. Wildlife viewing is excellent in this area. Bison, elk, and coyote are readily seen. Early morning or at dusk provide the best opportunity to spot wolves or grizzly bear. 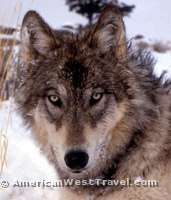 The Lamar Valley has been a wolf watching mecca since the wolves were reintroduced in 1995. Slough Creek (to first meadow). Round trip 4 miles (6.4 km), moderately strenuous. The trail starts on the gravel road to Slough Creek Campground, climbs through Douglas-fir forest, passes through an open area, and then descends to the first meadow of Slough Creek. This trail leads to popular fishing spots and to a private ranch north of the park, so expect to see people, horses, and an occasional wagon. If you encounter horses, move to the downhill side of the trail and remain still until they have passed. Trout Lake. Round trip 1.2 miles (1.9 km), moderate. The trail starts from a small pullout about 1.5 miles (2.4 km) south of Pebble Creek Campground on the Northeast Entrance Road and climbs about 150 feet (45.5 m) through Douglas-fir forest to the lake. Detailed Map of Tower Fall-Roosevelt area. Interactive Road Map of Mammoth Hot Spring to Tower Fall-Roosevelt. Interactive Road Map of Tower Fall-Roosevelt to Northeast Entrance. Interactive Road Map of Tower Fall-Roosevelt to Canyon Village. Things to Do in the Tower Fall-Roosevelt area. Day Hikes in the Tower Fall-Roosevelt Area (PDF File). The NPS operates three ranger stations in the Tower District. These are located at Tower Junction, the Lamar Buffalo Ranch, and the Northeast Entrance. The Tower Ranger Station issues backcountry and fishing permits. The Lamar Ranger Station, located at the Buffalo Ranch in the Lamar Valley, provides emergency visitor services only. Food services, ranger station, general stores, gas station, horseback riding (rentals), stagecoach tours, and picnic areas.